From the authors of At the Duke's Wedding. The road to happily-ever-after... With Kingstag Castle full of guests and the snow falling, Viola Cavendish has her hands full making sure the Christmas house party runs smoothly. The unexpected arrival of the Earl of Winterton and his nephew Lord Newton upends everything. Not only is Lord Newton flirting with the young ladies Viola is supposed to chaperone, Lord Winterton himself makes her pulse race. Seduced by a Rogue: Greyson Jones, an agent of the crown, is the only one who thinks being jilted has made Serena more alluring. When he lucks into an invitation to a Christmas house party at Kingstag Castle to cheer her up--and perhaps find her a husband--he seizes the opportunity to win her heart before they might be parted forever. The last time Lady Charlotte Ascot bumped into the Duke of Frye, she climbed a tree to avoid him. 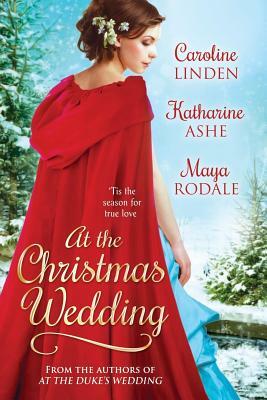 Sometimes it's simply easier to run away than to face her feelings for him -- overwhelmingly passionate feelings that no modest lady should have Now, on her way to Kingstag Castle to celebrate the holidays with friends, Charlotte is trapped by a snowstorm at a tiny country inn with the duke of her steamiest dreams. Maya Rodale began reading romance novels in college at her mother's insistence. She is now the bestselling and award winning author smart and sassy romances. She lives in New York City with her darling dog and a rogue of her own. Caroline Linden was born a reader, not a writer. She earned a math degree from Harvard University and wrote computer software before turning to writing fiction. Her books have won the NEC Reader's Choice Beanpot Award, the Daphne du Maurier Award, and RWA's RITA Award. Visit her online at www.carolinelinden.com to sign up for her newsletter, or find her on Twitter (@Caro_Linden) and Facebook (AuthorCarolineLinden). Katharine Ashe is the award-winning author of historical romances that reviewers call "intensely lush" and "sensationally intelligent," including How to Be a Proper Lady, an Amazon Editors' Choice for the 10 Best Romances of the Year, and How to Marry a Highlander, 2014 finalist for the prestigious RITA(R) Award. She lives in the wonderfully warm Southeast with her beloved husband, son, dog, and a garden she likes to call romantic rather than unkempt. A professor of history, she writes romance because she thinks modern readers deserve grand adventures and breathtaking sensuality too. For more about her books, please visit www.KatharineAshe.com.